The spiritual ecology movement is the future, otherwise there might not be any future! Plants like the water lily and lotus rise above the muck and obscurity of a pond or other water body to reach the surface and become illuminated by the sunlight. Such plants symbolize spiritual ecology in general and this Research Institute for Spiritual Ecology (RISE) in particular. Since Earth Day on April 22, 1970, the environmental crisis has only become worse. Certainly the usual secular approaches to the ecocrisis have been important, but just as certainly they have proven to be insufficient. These now customary approaches include environmental science and technology, environmental education and studies, environmental governance, law, and politics, and so on. Almost all of these ordinary secular approaches treat only the superficial symptoms of the ecocrisis, not its deeper causes. Many profound thinkers consider the root causes to be essentially moral and ethical, and accordingly, also religious and/or spiritual. Only a most profound rethinking and transformation of culture, encompassing worldview, values, attitudes, behavior, and institutions from the individual to the social and global levels, holds any real promise for creating a more sustainable, green, just and peaceful relationship between humans and nature. Ultimately, religion and spirituality are the last hope to alleviate, or at least reduce, the environmental crises that plague humanity from the local to the global levels. Spiritual ecology is an intellectual and practical response to this dire need for the survival, well-being, and flourishing of planet Earth including humanity. 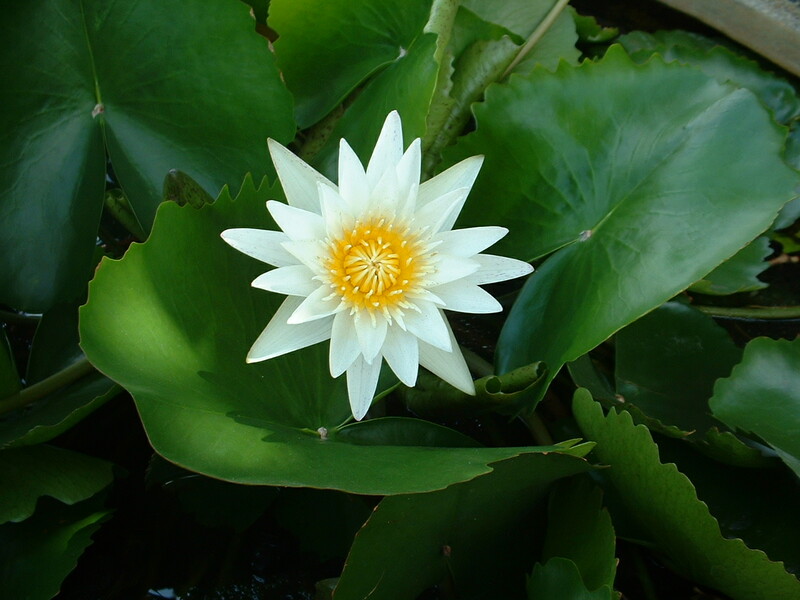 Plants like the water lily and lotus symbolize and inspire this initiative toward creating and maintaining a more enlightened and viable sentient ecology. Spiritual ecology encompasses a vast, diverse, complex, and dynamic arena of intellectual and practical activities at the interfaces of religions and spiritualities on the one hand, and on the other, ecologies, environments, and environmentalisms. Although this arena has deep roots extending far back into history to pioneering personages such as the Buddha and St. Francis of Assisi, in modern times, especially from the late 1980s through today, there has been an exponential efflorescence of activity in spiritual ecology. This includes not only a proliferation of publications like specialized textbooks, anthologies, and even two journals, but also organizations, conferences, workshops, projects, courses, programs, and so on, including at top universities like the University of Florida and Yale University. In short, this is a most fascinating, progressive, promising, and exciting development that has already generated substantial intellectual and pragmatic accomplishments and is increasingly recognized and appreciated as such. It is a pivotal component of “The Great Turning,” a third revolution beyond agriculture and industrialization to a more life sustaining and enhancing society that Joanna Macy has worked on for decades. RISE is one of these projects. It is a natural outgrowth from decades of teaching, research, and publications on spiritual ecology and sacred places with fieldwork in Thailand by its founder and director. Its primary mission is to serve as a catalyst for meaningful information exchange, including rigorous discussion and debate. Its venue is exclusively the internet. Accordingly, this project is limited only by time and imagination, not by money. Available free to anyone in the world with access to the internet, this website contains an extraordinary wealth of information, including extensive lists of books, websites, and films on spiritual ecology and related phenomena like sacred places. Beyond relevant aspects of this homepage, RISE will also eventually initiate and host a series of internet seminars, conferences, and workshops with a select group of the most relevant scientists and academics on specific topics such as Buddhist ecology and environmentalism in the East and West. Beyond stimulating, informative, penetrating, and insightful dialogues, such projects will also provide a context in which participants can further develop drafts of article or chapter manuscripts for future publication through the benefit of constructive comments, criticisms, and suggestions from interested colleagues. In this respect, RISE serves yet another important function. Typically individuals travel long distances to meetings at considerable expense, and not only for airfare, lodging, meals, and registration fees, but also in terms of their environmental impact. Imagine the ecological footprint of several hundred or even thousands of participants who travel long distances to attend a conference for just a few days each year. RISE provides an opportunity for intellectual activity focused on spiritual ecology that minimizes temporal, economic, environmental, and other expenses. Moreover, whereas most conferences allow only 15-30 minutes for the presentation of an individual paper and thereafter perhaps about 5-10 minutes for discussion, presentations and discussion in RISE events are not so severely constrained. To optimize the dialog and its management, however, this component of RISE will be restricted to a few selected individuals who are especially invited to participate, this in contrast to the world-wide availability of the remainder of this web site with its variety and abundance of useful resources. On other occasions participation may be unrestricted and public. Finally, it is noteworthy that because RISE does not depend on financing from any grant or other agencies, it escapes the constraints that any funding would impose on the usual research institute and its functions and contents. It also escapes the time and effort that would be sacrificed in regular fund raising to create and maintain an ordinary institute. Instead, the success of RISE will be generated by the genuine intellectual, moral, ethical and spiritual commitment, creative energy and achievements, and good will of its participants who, like RISE, can transcend monetary and other material considerations and restrictions to collaborate in a mutually rewarding project. 1998, “The Historical Ecology of Thailand: Increasing Thresholds of Human Environmental Impact from Prehistory to the Present,” in Advances in Historical Ecology, William Balee, ed. New York, NY: Columbia University Press, Ch. 17, pp. 376-404. 2015, “Sacred Caves of the World: Illuminating Darkness,” in The Changing World Religions Map, Stan Brunn, ed., Dordrecht: Springer, pp. 503-522. Also, 2014 (July 10), invited PowerPoint lecture on “Spiritual Ecology: Is it a possible solution to the environmental crisis?” Bangkok, Thailand: Spirit in Education Movement. 2015 (September-December), “Spiritual Ecology: Is it a Solution for the Environmental Crisis,” invited for Seeds of Peace 30(3):29-31. Guest lectures on spiritual ecology in anthropology programs at Chulalongkorn University and Thammasat University in Bangkok and at the Natural Resources and Environmental Management Program of Mae Fah Luang University in Chiang Rai, Thailand during summers of 2014-2015. In July 2015 visited the sacred cave at the meditation Wat Tham Doi Tone near Chiang Mai in northern Thailand to start ongoing collaborative project with the resident American Buddhist monk Jake Douglas. 6. November 14-18, 2012, “The Anthropology of Buddhism and the Buddhism of Anthropology: Crossing the Boundaries of Science and Religion,” Organizer and Discussant, annual convention of the American Anthropological Association, San Francisco, CA. 2014 (April), invited Feature Article – Bibliographic Essay – “Spiritual Ecology: Is it the Ultimate Solution for the Environmental Crisis,” CHOICE 51(8):1339-1342, 1344-1348. 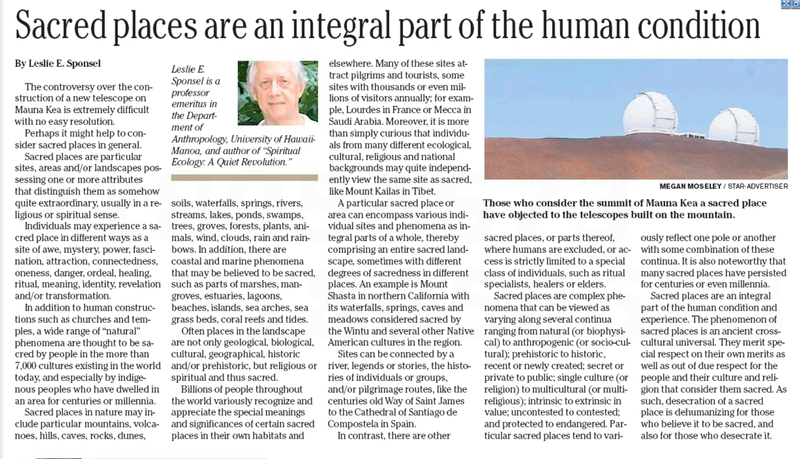 2015 (April 9), “Sacred places are an integral part of the human condition,” Honolulu Star Advertiser, p. A13. https://sacredmaunakea.files.wordpress.com/2015/04/sponsel-on-sacred-places-star-advertiser-9-april-2014.png. 2015 (June 22), “Are the Far-sighted Promoters of TMT Myopic?,” http://sacredmaunakea.com/2015/06/22/the-far-sighted-defenders-of-tmt-are-myopic/. 2000, “Does Buddhism Have Any Future? : Some Thoughts on the Possibilities of Buddhist Responses to the 21st Century,”(co-author Poranee Natadecha-Sponsel) invited for Seeds of Peace 16(1):36-39, January-April issue. 2013, “Buddhism and Ecology,” invited for Encyclopedia of Psychology and Religion, David A. Leeming, ed., Berlin, Germany: Springer-Verlag, 1:214-219. 2015, “Buddhism: Environment and Nature,” invited for Encyclopedia of the History of Science, Technology, and Medicine in Non-Western Cultures (revision and update for Third Edition), Helaine Selin, ed., The Netherlands: Springer (in press). 2015, “Teaching Buddhist Ecology and Environmentalism,” in Teaching Buddhism, Gary Delaney DeAngelis and Todd Lewis, eds., New York, NY: Oxford University Press, 2011 (with Poranee Natadecha-Sponsel)(in press). 2005, Encyclopedia of Religion and Nature, Bron Taylor, Editor-in-Chief, New York, NY: Continuum, “Anthropologists” 1:94-96, “Anthropology as Source of Nature Religion” 1:96-98, “Biodiversity” 1:179-182, “Caves – Sacred (Thailand)” 1:276-278, “Noble Savage and Ecologically Noble Savage” 2:1210-1212, “Rainforests(Central and South America)” 2:1338-1340, “Southeast Asia” 2:1582-1585, “Trees- Sacred (Thailand)” 2:1661-1663. 2013, “Spiritual Ecology,” invited for Encyclopedia of Psychology and Religion, David A. Leeming, ed., Berlin, Germany: Springer-Verlag, 3:1718-1723. 2013 (September), “The Ecological Imperative for the 21st Century,” Kosmos http://www.kosmosjournal.org/voices-of-people/the-ecological-imperative-of-spirituality-for-the-21st-century. 2013 (October 1), “Spiritual Ecology, Connection, and Environmental Change,” AAA Anthropology and Environment Society Engagement Blog: http://www.aaanet.org/sections/ae/index.php/leslie-sponsel-on-spiritual-ecology-connection-and-environmental-change/. 2014 (Summer), “Spiritual Ecology: The New Revolution in Consciousness,” invited for Sufi Journal 87:18-23 (http://www.sufijournal.org/les-sponsel). 2014, “Spiritual Ecology as an International Environmental Movement,” in Occupy the Earth: Global Environmental Movements, Liam Leonard and Syra Buryn Kedzior, eds., Advances in Sustainability and Environmental Justice 15:275-293, New York, NY: Emerald Group Publishing Limited. 2015, (September-December), “Spiritual Ecology: Is it a Solution for the Environmental Crisis,” invited for Seeds of Peace 30(3):29-31. 2015 “Spiritual Ecology, Sacred Places and Biodiversity Conservation,” in Environmental Anthropology Handbook, Elleanor Olimet and Helen Kopenina, eds., New York, NY: Routledge (submitted). 2015, “Lynn White, Jr., One Catalyst in the Historical Development of Spiritual Ecology,” invited for Lynn White Retrospective after 50 Years, Todd LaVasseur and Anna Peterson, eds. New York, NY: Routledge/Taylor and Francis (submitted). 2015, “Spiritual Ecology and Radical Environmentalism,” invited for Routledge Handbook of Religion and Ecology, Mary Evelyn Tucker, John Grim, and Willis Jenkins, eds., New York, NY: Routledge (submitted). 2015, “Love in/of Nature: Biophilia, Topophilia, and Solastalgia,” invited for Love in the Time of Ethnography, Lucinda Carspecken, ed. (submitted). 2015, “Sacred Ecology,” invited for the International Encyclopedia of Anthropology, Hilary Callan, ed., London, UK” Wiley-Blackwell (in press). 13. Fall 2015, new ongoing project of serving as a voluntary, informal, individual consultant for the development of the anthropology graduate program and spiritual ecology in particular at the Royal Thimphu College in Bhutan: http://www.rtc.bt.